Roderick D. Buchanan on ‘probably the most divisive figure British psychology has ever produced’. Hans Jürgen Eysenck – has there ever been a psychologist like him? Born in Berlin in 1916 during the Great War, Eysenck was a leading figure in postwar British psychology. He developed a distinctive dimensional model of personality based on factor-analytic summaries, audaciously attempting to anchor these dimensions in biogenetic variation. Eysenck also played a pivotal role in the emergence of clinical psychology in Britain, tirelessly promoting new behavioural treatment regimes over more traditional psychoanalytic approaches. Eysenck’s parents had ambitions for him in the theatre, and he wanted to be a physicist. After graduating from secondary school in 1934, he fled Hitler’s Germany and arrived in London the following year. He enrolled in psychology at University College, London, where he took a degree and then rapidly completed a PhD on aesthetic preferences supervised by Cyril Burt. At the outset of the war, Eysenck was declared an enemy alien. Following a spell as a firewatcher, he landed a job at the Mill Hill Emergency Hospital in 1942. Headed by the imposing figure of Aubrey Lewis, Mill Hill functioned as the relocated Maudsley Hospital. After the war the Institute of Psychiatry (IoP) was established, a training and research facility affiliated with the Maudsley and Bethlem hospitals. The IoP Psychology Department provided a stable institutional environment where Eysenck spent the rest of his career. By 1955, he had become a full professor heading a research programme that blended experimental methods with an individual differences perspective. Although he retired in 1983, his research activities and writing continued unabated until his death in 1997. The heavily cited author of more than 80 books and over 1000 scientific papers, Eysenck was also a renowned populariser. But that was not the half of it. Eysenck was probably the most divisive figure British psychology has ever produced. No other psychologist aroused such contrary reactions from the public and from his scientific peers. While he introduced psychological science to the masses, he achieved much wider public notoriety as some kind of ‘IQ warrior’. The race and IQ issue defined Eysenck in the public imagination. It is usually the first thing anyone outside the scientific community can recall whenever his name is mentioned. Yet race and IQ was a side issue for Eysenck and the brouhaha he helped create a bit of a sideshow. It is not how Eysenck would like to be remembered; he tended to emphasise his more substantive scientific contributions. Likewise, his scientific peers had an appreciation of him that went beyond the headlines. However, as anyone interested in his legacy quickly discovers, the nature of this appreciation greatly depends on who you ask. He was an intellectual leader in personality psychology who was greatly admired by a host of students and influential colleagues, yet repeatedly dismissed by many critics as arrogant and self-serving, and all too fond of the limelight. Previous accounts of Eysenck’s life and work reflected this partisan landscape. Eysenck himself supplied versions of his life-story for dictionaries of biography and autobiographical collections, as well as putting out two editions of a full-length autobiography. Provocatively titled Rebel with a Cause, they painted a picture of the fearless outsider unintimidated by established orthodoxy, as childhood memories gave way to lengthy accounts of the various ‘battles’ he engaged in. Moreover, the only biographical account not written by Eysenck came from an acolyte of sorts, H.B. (Tony) Gibson. Written in 1981, Gibson’s Hans Eysenck: The Man and His Work was necessarily incomplete, since Eysenck was still a couple of years away from embarking on an extraordinarily energetic retirement. In the Australian summer of 2000/2001, I learnt of a Wellcome Trust-supported project conceived by Trudy Dehue and Maarten Derksen at the Heymans Institute of the Psychology Department at the University of Groningen. Parachuted in, I was given immense support but also great freedom. As a science history specialist from the antipodes, I liked to think I bore no scars, sported no badges of allegiance. To me, Eysenck was just another prominent figure in the annals of the history of psychology. I had mentioned him, sometimes quoted him, when writing about the history of clinical psychology, personality testing and the like. I knew little of his personal history. Nevertheless, there were some special problems and challenges involved with taking on such a subject. Eysenck so divided his public and his peers that a privileged, singular viewpoint seemed impossible. However, I saw this divergence of opinion as utterly fascinating, positively begging explanation. And by taking it all seriously – even its most idolatrous and salacious extremes – I hoped to avoid accusations that there was something about the man I was avoiding. The legend-making PR of Eysenck’s memoirs buttressed one end of this opinion spectrum. They provided a kind of dialogical foil to compare with more sceptical accounts and the general historical record. If people can be said to have public professional life, a personal private life, and an inner intellectual life, then my focus was very much on the public professional man. Eysenck revealed only strategic elements of his personal private life, and his immediate family have maintained this stance, choosing not to preserve his personal papers. This fact alone would seemingly place an enormous barrier to any new biography, but in some respects it was quite liberating. It freed me from the obligation to follow the personal aspects of my subject’s story in circumscribed if not authorised terms, and it limited my obligations to the writing of good history. There was still a considerable amount of archival research to be done, for much of Eysenck’s correspondence, meeting minutes, research proposals had been preserved, scattered in various collections around the globe and on the web. But given Eysenck covered so much ground as a scientist and public intellectual, there was more than enough in the public domain to fill several books. He was a man who virtually turned himself inside out: almost every idea, hunch or half thought got put out there, incorporated into a presentation, paper, rejoinder, letter or book. Despite the banner press and TV glare, Eysenck was actually an intensely shy, somewhat aloof figure. He did not do small talk easily, preferring to talk about work at social gatherings. He was never one for thankless committee work and organisational tasks, and he never fitted in comfortably with established associations, preferring to form his own. But he had a competitive streak that drove his immense productivity. He treated science as a game, and he played to win. Intellectual debate was a kind of sporting joust. Thus Eysenck and controversy were a natural marriage. Controversial issues gave him the opportunity to display his dazzling rhetorical skills, affirming a strictly adversarial model of science in the process. It was the game rather than the limelight he was addicted to. Eysenck never compromised on the simplicity of his three dimensions as sufficient to describe the underlying structure of personality. However, his attempt to reconcile Cronbach’s two schools of experimental and correlational psychology was met with indifference bordering on hostility. While he may have had the intellectual power and the disciplinary reach to break down such entrenched barriers, his partisan, non-conciliatorily style worked against him. These personal proclivities also went some way in explaining why Eysenck attracted so much hostility and slander. Those on the wrong end of his pen or tongue likened Eysenck to a prosecuting lawyer selectively marshalling facts for a preferred point of view. Moreover, he did little to the soothe the bruised egos this produced, little to clarify the doubts. And if some thought of him as a monster, then he was monster of the discipline’s own making. He dominated in an era when quick publications and statistically significant results were the order of the day. Eysenck adapted accordingly. With a postgraduate student army of researchers at his disposal during much of his heyday, he could afford to be more selective than most, churning out empirical papers and book-length theoretical integrations at will. Replication, adjustment and revision were less rewarded, and often had to wait. For someone seemingly so ruthless, Eysenck was also quite trusting. He gave almost unconditional loyalty, and he inspired it in return. But his loyalty was not always well placed, as he embraced causes and collaborators no one else would. Increasingly wedded to a past of heterodox positions, he painted himself into several corners. Probably the best example of this was his persistent denial of the carcinogenic effects of tobacco. Eysenck maintained that cigarettes should be given the benefit of the doubt, despite the mounting evidence. However, Eysenck received the millions of pounds from the American tobacco industry over several decades, only some of which was declared at the time. Litigation-driven archival stores have made it possible to investigate just how deep this relationship went. 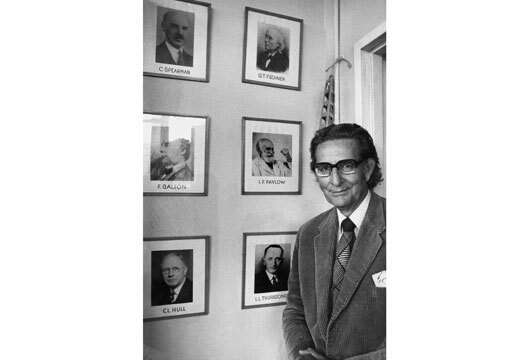 The controversial epidemiological research of Ronald Grossarth-Maticek was, Eysenck hoped, the ultimate comeback – since it suggested that psychosocial personality factors were the main culprit. Eysenck extended on and promoted this research tirelessly in the 1980s and 1990s in the face of immense scepticism. While Eysenck always waved away the criticism, his certainty in his own independence was not shared by many observers, nor his indifference to issues of conflict of interest and ethical oversight. And what of the race and IQ issue? The controversy certainly took its toll on Eysenck, more than he was prepared to admit. Drawn into it partly out of loyalty and partly as a kind of debating challenge, the controversy blended the scientific, political and the social like no other. Perhaps one would have to go back to his childhood to explain his motivations, for that is exactly what he did. During the controversy Eysenck used his experience of pre-war Berlin to bolster his anti-fascist credentials. The fairly scant records surviving from this period paint a complex but incomplete picture, but they were enough to make some of the claims he made seem a bit of a stretch. His childhood also offered an insight into his distaste for politics and his faith in the superordinate power of science. Today in the era of genome-mapping, it all has a sepia-toned quality. Some but not all of the heat has gone out of the issue as more contingent answers to the nature/nurture dichotomy are put forward. Old political certainties have likewise been muddied. With the dominance of sophisticated biogenetic techniques in the neurosciences and beyond, Eysenck’s conservative nativism – so against the grain in the 1960s and 1970s – now looks both cruder and more prescient. In the course of getting Playing with Fire: The Controversial Career of Hans J. Eysenck to print in the UK I have learnt a lot about what Simon Singh has described as the most hostile libel laws in the world. That, however, is another story – this is Eysenck’s. Playing with Fire is an attempt to provide a full and frank account of this inveterate controversialist’s career, the man they loved to hate. - Editor’s note: For Michael Eysenck’s review of Playing with Fire, see the September 2010 issue.